The value of ITIL Incident Management is not restoring service. You heard me right. If you’re focusing on how quickly you resolve Incidents, you’re missing the point. Don’t believe me? 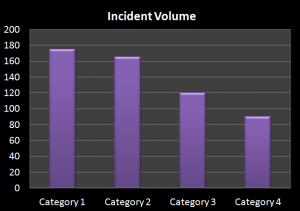 Read to find the real value of Incident Management. If you’ve been in IT for more than a few minutes, you’ve heard the goal of Incident Management – the prime directive – is to rapidly restore service to the customer. It’s true, and a good start, but it’s a reactive treadmill that has no real value to customers. If all you do is restore service, regardless how quickly, you’re missing the point. Because what your customers really want is services that never go down in the first place! Incidents are not happy moments for customers. Let’s say you discover your bank account is several hundred dollars short. Heck, its a made up example; let’s say its several thousand short. You call the bank and they take your name and account information. They verify that you are who you say you are, and begin researching your problem. After putting you on hold several times, they discover an error has occurred, and they need the manager’s approval to correct. Another bout with the funky hold music, and your customer representative announces that he’s corrected the problem. Let me ask you; is this valuable to you? In dollars, I mean. Has this interaction with the bank been valuable to you? Has your bank balance gone up as a result of the time you spent with Customer Support? Answer: No. The net net is back to normal. No positive value. But wait. Let’s say you’re the owner of a small business. You work nights and weekends to keep your business growing. You work all these hours because if you don’t, the business won’t be profitable. Your time is valuable. Every minute you spend on the phone with the bank is time that you’re not working your business and making a profit. (Loss of real value). Good Customer Service can make the experience more pleasant. Good tools and processes can make it quicker. But nothing changes the fact that an Incident is a value reducing experience. Good Incident Management minimizes the loss, but don’t buy the lie that Incident Management has value to the business. Get over yourself, and look at IT the way the business does. What’s the Real Value of ITIL Incident Management? While Incident Management quickly restores services, the goal of ITSM is to increase business value. If you’re doing even Basic ITIL Incident Management, the data you collect in the process of restoring service is purchased at a price. It’s an asset. (Staff and customer time, opportunity cost, training, tools, etc). If we’re going to make the investment, we should at least get some (positive) value out of it. In the era of Big Data, it’s inexcusable to sit on piles of data and not use it! If you asked your business if they could use an extra 10% in staff time to do their jobs, they’d say “oh, heck yeah”. That would definitely be a value-add. Well, forget about call volumes, average call times, and first call resolution. These do nothing to add value. Go back to the bank example and tell me if the business owner gives a rip. What are you doing to continue improving my staff’s productivity? Now these have real value. Incident data is a valuable source of quantified information about what’s actually failing and why. Use the knowledge of Incident responders to identify potential changes that can reduce or eliminate sources of Incidents. Work with the business to prioritize these improvement opportunities, and drive through Continual Service Improvement. 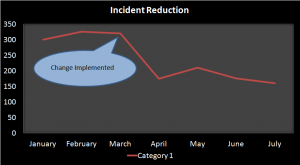 Monitor Incident reduction, and adjust improvement efforts accordingly. Customer perspective – if you’re going to take my time fixing things that shouldn’t have broken, you can at least do it quickly. The ability to quickly identify symptoms with likely causes can greatly reduce Incident recovery time. While having the ability to search previous Incident resolution information can help, bigger gains can be had through basic Knowledge Management – proactive analysis of Incidents and resolutions, and creating a collection of authoritative knowledge articles describing the failure symptoms and how to restore. Nearly all Incident Management tools include some form of Knowledge Management. Use it. Well trained Service Desk staff with ready access to this kind of information can greatly reduce recovery time. Self service has become pretty common as well. This allows customers to walk though an automated troubleshooting tree, and if their problem qualifies, a “click here to fix” button can automate the restoration of service. This requires a heavy investment in building troubleshooting trees, creating corrective packages, and thorough testing. 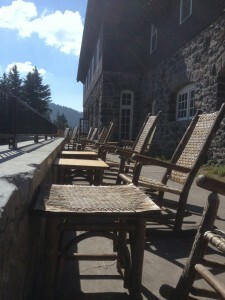 But the improvement to recovery time can be significant. As you’re analyzing Incident Management data, be on the lookout for opportunities to improve services and satisfy unmet needs. What new or changed services could improve customer effectiveness? Where and how could new technologies or services relieve pain points for customers? Are there areas where additional user training could help? Can the training cost be justified by increase in user effectiveness and less time with the Service Desk? What features of services cause the most questions and frustrations to customers, and what could be changed to make it less confusing and frustrating? How are customers using services in unexpected/creative ways that might indicate unmet needs? What workarounds are customers using to compensate for shortcomings in services? Where could one customer group benefit from leveraging what other customer groups are doing? What “why can’t I…” questions could be resolved by new or changed services? What needs do customers face for which IT does not (yet) offer a service? How could customers benefit from use of technology that other companies are using? When customer questions are answered with “because of policy…” there’s an important learning opportunity. What is it? How can it be changed to better serve the customer? When IT staff think “this would be so much easier if we could just…”, there’s an opportunity. I know, some of you are thinking – that’s all great and everything, but out here in the real world….I barely have enough staff to just respond to every incident, let alone do more. I get that. I’ve lived it. But here’s the deal. You can either continue to be a necessary evil, a net-zero function. Or you can be a respected value-added organization. The real value of ITIL Incident Management is how you use the valuable information you (and only you) possess to improve IT Services. Start small. Identify one big call generator, and champion an effort to reduce. Talk with staff about the real value of Incident Management, and get them engaged in proactive Incident reduction. How have you created real value for your customers with Excellent Incident Management? What is Basic ITIL Problem Management?